This newly discovered planet is just 22 light-years away. Its discoverers are calling it the "new best candidate" to support water, and possibly life. 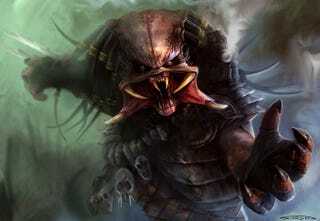 The planet's unique features could even make it the ideal home for creatures like the Predator! We talked to the experts, to find out why this new-found world might harbor very different creatures than our own planet. The newly discovered planet, which has the rather catchy name of GJ 667Cc, is at least 4.5 times the mass of our planet, and it orbits its host star every 28 days. While that may not sound anything like our planet, the fact that it orbits a much dimmer red dwarf star means that it ends up getting about 90% of the sunlight we get on Earth. But most of that light would be infrared, which would allow the planet to absorb more energy than if the light was in optical wavelengths. We can only speculate how life might evolve differently on a planet that is predominately bathed in infrared light. Our first thought was that organisms on GJ 667Cc might have their vision centered on infrared wavelengths instead of optical ones. Of course, there's no better example of an infrared alien than your friendly neighborhood Predator, which pretty much demands the question: is GJ 667Cc the Predator's home planet? We know that the distribution of radiation from GJ 667C, an M1.5V star significantly cooler than the Sun, will have a larger fraction of its energy at longer (IR) wavelengths. We also know that most atmospheres have gases that absorb more efficiently in the IR. Thus, the net effect would be to make the absorption of that light (by the atmosphere itself as well as by whatever makes it to the surface) will be a bit more efficient. So this is completely legitimate speculation. But again, all such statements need to be taken with the proper grain of salt. It is a very complex radiative transfer process that requires proper modelling to quantify. Either way, Vogt said that this doesn't significantly affect the planet's chances of supporting life, regardless of what spectrum that life sees in. Now, this star is red and has most of its flux in the nIR infrared, which is more efficiently absorbed than optical wavelengths. So it requires less energy flux from the star to keep (90%) it warm. Of course this means that any hypothetical life form (e.g. plants) on the plant, should better work in the infrared than in the optical. There are a few studies trying to figure out how vegetation could evolve on such red systems. Same would apply to optimal eyes of animals. In any case, what we call red or blue is very heliocentric (our senistivity to colors is centered on the maximum of the solar spectrum). Yes, that planet would seem to be late evening all the time (still warm) for us, but certainly not for something that evolved there. Basically, if GJ 667Cc does support life, then we could indeed be looking at an infrared-dominated biosphere. But somehow I'm guessing the scientific community isn't going to get on board with any proposals to rename this planet Yautja Prime. Science fiction movie tie-in implications aside, GJ 667Cc has some other fascinating features. Part of a triple star system, the other two stars in the system orbit much further away from the planet and are both orange dwarfs, making them slightly smaller than our Sun. The composition of these stars is unexpected for a potentially habitable solar system. They have only about 25% the amount of heavy elements that our Sun does, which were thought to be essential building blocks for rocky planets. For more on this discovery, check out the Carnegie Institution. Our thanks to Guillem Anglada-Escudé and Steven Vogt.